Grand Conquest from Numbskull Games, is now available over here in the US. We have just got in the long awaited 3 pallets of Grand Conquest games from Europe. These are German games with English rules included. Since the game is like chess with no text on board or cards etc., these work fine in English. 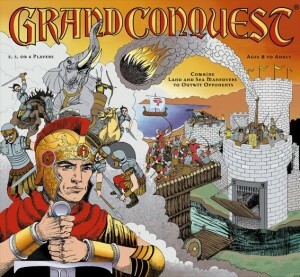 Grand Conquest follows the original Conquest, published in 1972, but is a stand alone game. With this set, both Conquest and Grand Conquest can be played. Grand Conquest adds an entire new dimension of siege combat to the classic game.